The prints of the Mary Katrantzou Spring/Summer 2011 Show reproduced photographs of interiors, taken from old issues of « Architectural Digest ». 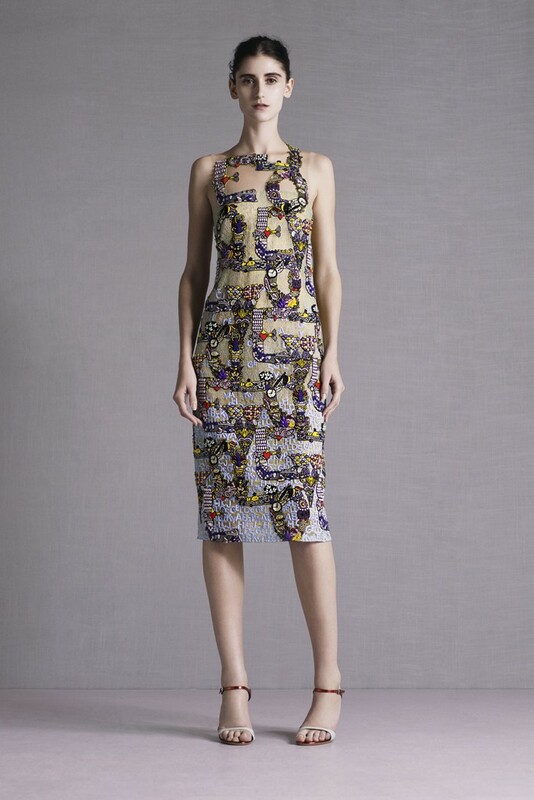 Milton Glaser’s ’60s fonts have influenced the Mary Katrantzou Resort 2015 Collection. Other Milton Glaser-inspired pieces : Jeremy Scott Spring/Summer 2011 (the 1st look reinterpreted Milton Glaser’s 1977 « I Love NY » logo), 3.1 Phillip Lim Spring/Summer 2013 (the 20th and 34th looks, with the « I Love Nueva York » logo, were based on the American graphic designer’s iconic « I Love NY » logo). The embellishments, prints and textures of the Rebecca Minkoff Pre-Fall 2014 Collection are influenced by Candace Wheeler. The « butterfly » sandal of the Sergio Rossi by Angelo Ruggeri Resort 2014 Collection pays tribute to Gabriella Crespi’s 1974 « Gocce Oro » candelabra. 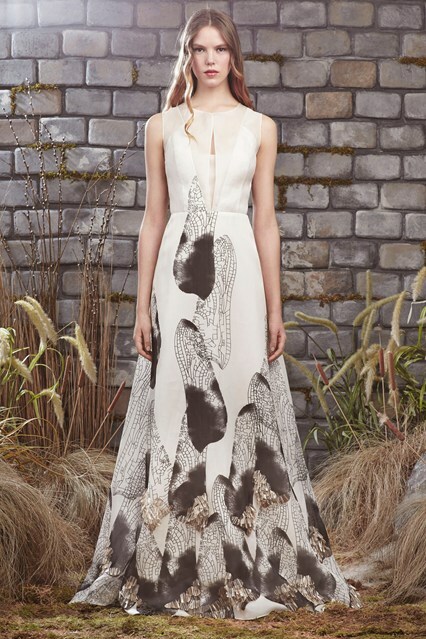 The « wings » hand-drawn pattern in the Honor Pre-Fall 2014 Collection is based on Neri Oxman’s metamorphosis studies. Arne Jacobsen influenced the curvilinear shapes of the Lela Rose Spring/Summer 2014 Show. Other Arne Jacobsen-inspired collections : Atelier Gustavo Lins Couture Autumn/Winter 2010-2011 (this collection especially referenced Arne Jacobsen’s « Series 7 » chair), Peter Jensen Autumn/Winter 2013-2014 Menswear, SportMax Autumn/Winter 2011-2012 (Arne Jacobsen’s timeless design was one of the inspirations of this show). Moreover, in 2008, Paul Smith has edited a miniature version of the « Egg » chair, produced by 1.6 Design, to celebrate the 50th anniversary of Arne Jacobsen’s iconic creation, and, in 2010, Stelton has launched the Arne Jacobsen / Paul Smith-signed « Add Colour » collection (which featured items such as teapots).